Furr Family Four: The carvings! IMG_0075.JPG, originally uploaded by jodifurr. So, what did we do with those pumpkins, carve them of course. 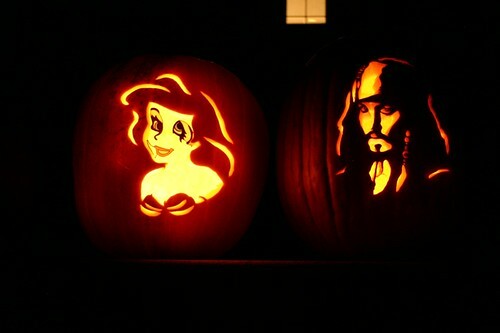 Ani is going to be Ariel and Ruston is going to be a pirate, so that is what are pumpkins are. If you have ever seen those pumpkin carving kits - here is proof they work. O.k . we had ariel's eye wrong, but other than that, these are pretty darn good. I carved Jack Sparrows! The kids love them, I just hope they last another week!